I have been lucky with the Glyders. I have only spent three days on them, the weather has been magnificent each time, and potentially complex map-finding has been simple and straightforward – with one single youth-induced exception, as you will see. No doubt these hills can be frightening and challenging; maybe they are more fun that way, but I doubt I will ever know. 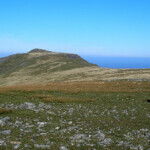 Glyder Fawr (3279ft) and Glyder Fach (3262ft) are the two highest peaks in the range. 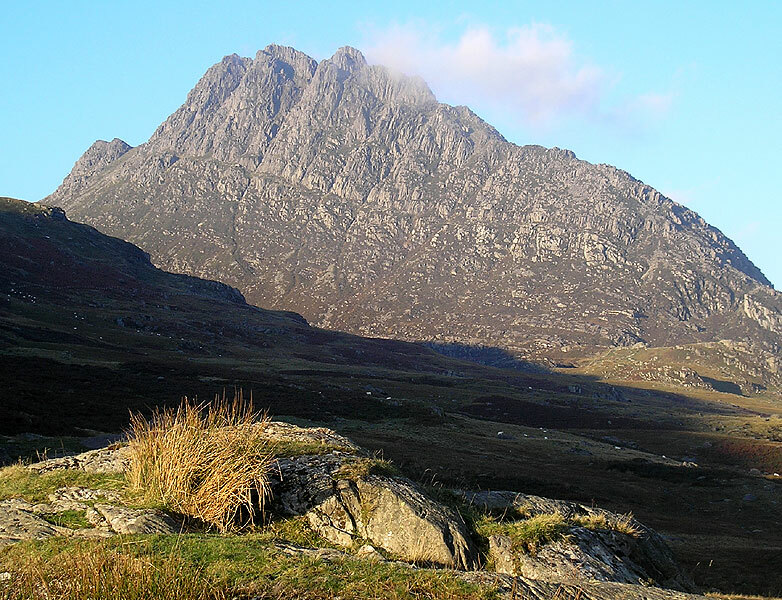 Tryfan (3010ft), by contrast, is the smallest of the 3000-footers, but what a hill; a stark mountain shape, held in perfect profile, a character all of its own. 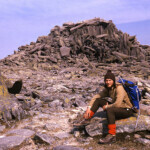 And when I came to Snowdonia, in April 1974, with my (now) long-time walking companion Dave Travers, I knew none of this. I had Poucher’s then-classic guide book, and so some pretty decent pictures to go by, but there is nothing to prepare the unknowing for the sheer impact of Tryfan as you drive west from Capel Curig – or even better, as I was to find out more than 30 years later, to walk along the old road and turn the corner just before Gwern Gof Isaf. 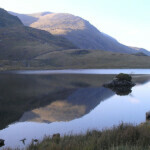 The view from the its bunkhouse, where I stayed, is pretty spectacular too. 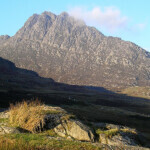 Back in ’74, we parked at Ogwen Cottage and tackled the famous north ridge of Tryfan. I remember boulder after boulder, but never any doubt over the route. On the summit, we bottled out of the hop from Adam to Eve, the twin rocks of the summit that can be seen from the valley below. 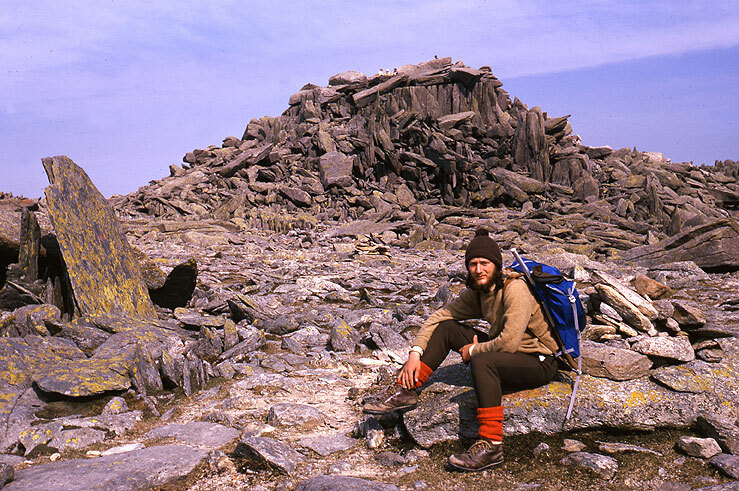 Glyder Fach is next, then the utterly sensational shattered rock of Castell y Gwynt – castle of the winds – before the bwlch between the two Glyders and the final climb up Glyder Fawr (the sidebar picture shows 70s gear modelled by the author). And then it’s all downhill. 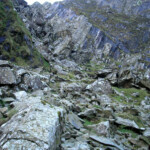 The descent to Llyn y Cwn is sharp, and from there to the valley floor the main track goes through the Devil’s Kitchen, a damp dark and spooky place carved through a great fissure in the rocks. 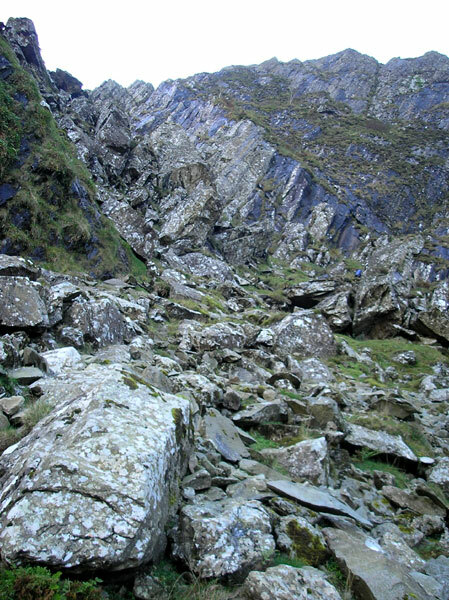 Except that on this calm and pleasant April evening, few people around if I remember, I completely mistook my bearings and we set off to descend, not by the Kitchen at all, but by the steep ground to the west of Llyn Idwal. Nobody shows a route there, nobody: I remember clutching at grasses, descending mostly by bottom, as I wondered why no path. Somehow, we got down; I’m not sure what Dave thought. It was probably the single worst error I have ever made in the hills. If it had not been dry and clement, I might not have been writing this page, or worse Dave might not have had a career. My 2006 return had to descend the Kitchen safely, for that reason: see below. 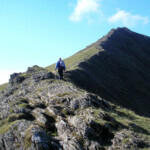 I came back to these hills in May 2009, for a change not leading. Barbara and I were staying at the Holiday Fellowship house in Conwy for a few days, and one of the walks was planned as the Tryfan / Glyders traverse, with ascent by the Heather Terrace, the prominent sloping route that runs about halfway up the eastern face of Tryfan before turning right for the summit. It’s a great way up and I much enjoyed it. 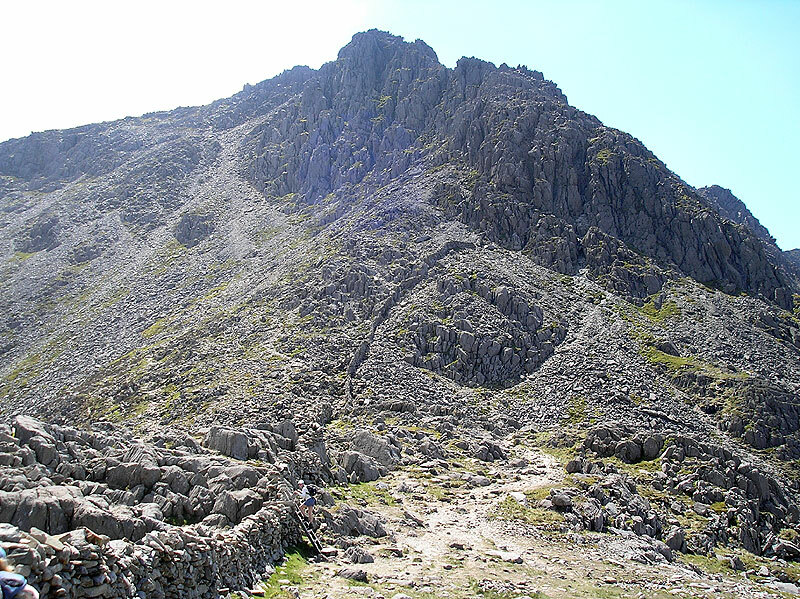 There’s a sharp descent to Bwlch Tryfan thereafter, and a tough ascent by the scree-ridden Bristly Ridge to the top of Glyder Fach. 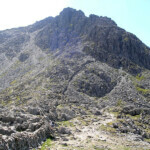 Unfortunately our leader was having a bad day – same problem as would hit me the following week in Scotland – and as we met another group from the house on the way to the top of Fach, who were to make an easier way down (by Cwm Tryfan) than our planned Devil’s Kitchen, it was decided to miss out Glyder Fawr and join them. A bit of a shame but as Barbara was in the other group I didn’t mind too much. 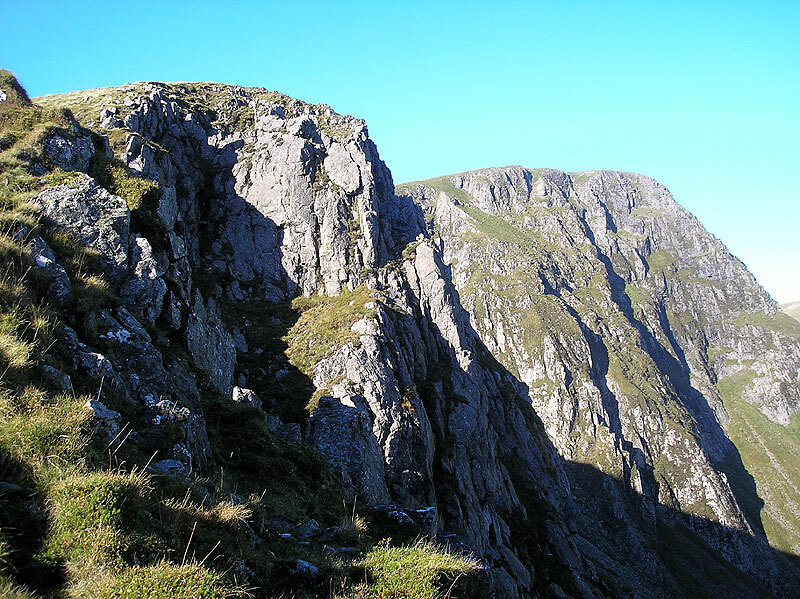 A popular walk this too, and the tops were thronged on this autumn Sunday in 2006. But there’s a wonderful quiet way up, which I’m sharing in the hope that you don’t all go and scar a quiet cwm with an unsightly path. 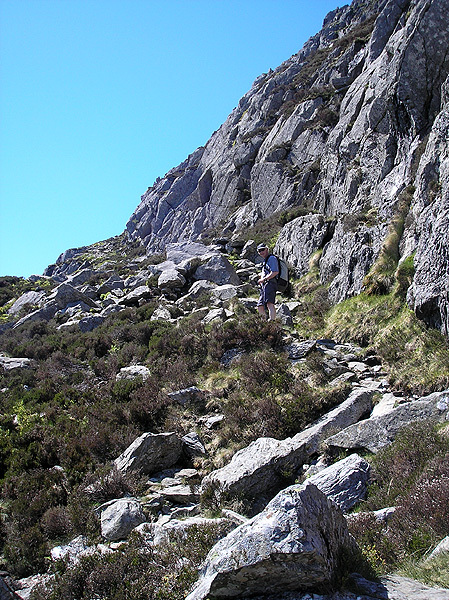 From Ogwen Cottage, there is a good ridge route to Y Garn’s summit (3104ft) by its NE ridge, but that makes for an out-and-back day with a lot of backtracking to pick up Elidir Fawr (3029ft) as well. 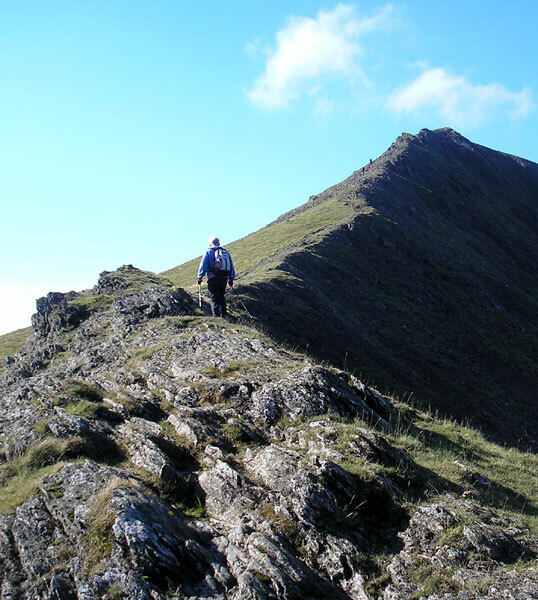 Hermon, in his invaluable two-volume Cicerone guide Hillwalking in Wales, mentions the ridge above Cwm Cwyion, further north, above the scrambler’s Mushroom Garden, but I wasn’t sure if it might itself be a bit too scrambly, or indistinct, to try solo. I’m glad I took the risk: it’s a pearl, not difficult, but continually interesting and crowd free. I found little path initially, but it was clearly visible crossing a patch of scree just over Afon Cwyion from around 636604, and then takes a curly but always sensible line above the Garden and on to the Foel Goch ridge. On Foel Goch (2726ft) I had company. I had picked up the Sherpa bus to avoid a couple of road miles to Ogwen Cottage, and on it got talking to another walker, similar vintage, objective also Elidir Fawr. 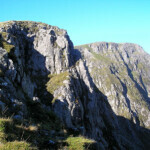 Coincidentally, we summitted together on Foel Goch – he had come up Y Garn’s NE ridge. 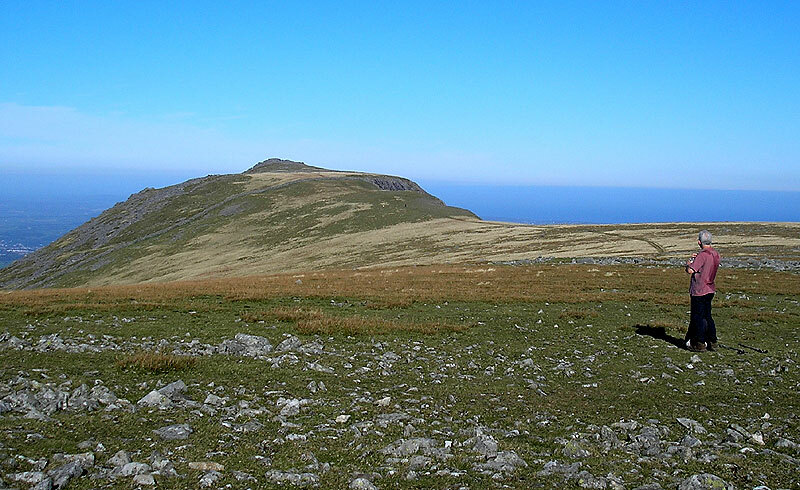 Rather than make a beeline for Elidir Fawr, we took advantage of the lovely sunny day to pick up Mynydd Perfedd (2664ft) and Carnedd y Filiast (2694ft) before turning round for the climb up to Elidir Fawr, its striking conical aspect well-seen from the Carneddau. From the summit, my companion dropped down towards Llanberis while I retraced my steps to the col below Elidir Fawr, then strking out below Foel Goch to Y Garn. The summit here was heaving; another chance for a chat with the like-minded, and trace a train puffing up the Snowdon railway. Now it was time for the Devil’s Kitchen. No mistakes. And how on earth could I have gone wrong last time. Maybe the tracks are deeper now, and there are bits of duckboarding which lead the right way, but really it’s not something I should have missed way back when. Dark and gloomy though the Kitchen, and in ice or a downpour the chances of a slip down this dank passage would render it very different. Taking the right-hand variant, there’s a step over a stream at 642588 which concerned a mother, her son only eight or so; ‘I can swim’ he was saying, but she and I knew that he would slip only once. 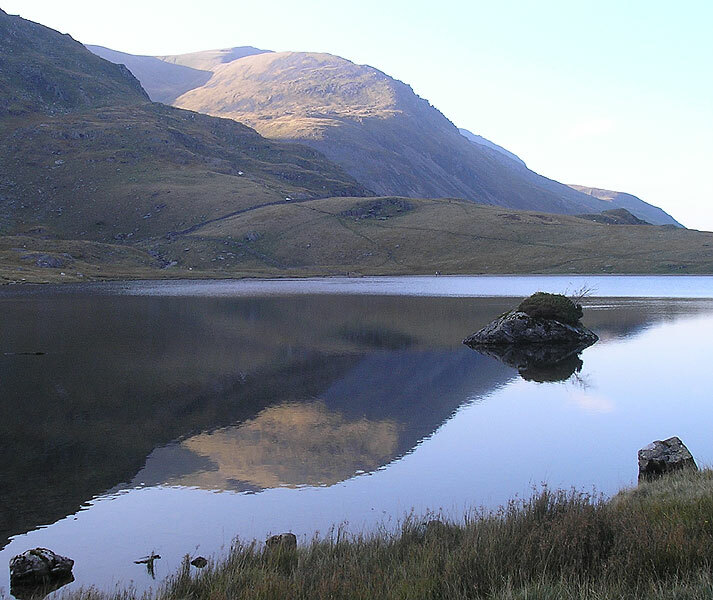 We talked about the rough ground leading direct to Llyn Idwal; a better option, which I am sure she took. But for me, place the poles and head for home, surveying my morning’s route far away. 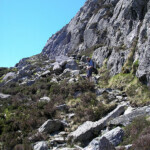 On no account try to replicate the route shown to the west of the Devil’s Kitchen!